Springfield and area partners are gearing up to celebrate “May is Bike Month” with several offerings of activities all month long related to bicycling from rides to speakers to workshops and more. Established in 1956, National Bike Month is an opportunity to showcase the many benefits of bicycling such as enjoying the outdoors, using a healthy transportation option to commute to and from work, and promoting tourism and economic development. Mayor Lundberg will read the “May is Bike Month” proclamation and recognize accomplishments made in the past year for bicycling in Springfield at the Springfield City Council meeting tonight at 7 p.m. at Springfield City Hall at 225 Fifth Street. CycloFemme bike ride is an international bike ride that celebrates women on wheels. This year’s ride will take place on Mother’s Day, Sunday, May 12. 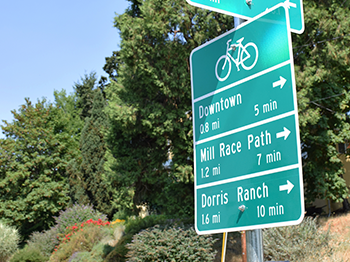 The Springfield ride starts at Willamalane Park Swim Center on G St and the Eugene ride starts at Owen Rose Garden. Both rides will gather at 1:30 p.m., ride at 2 p.m., and end at Island Park for a group celebration. Event is free. The City in partnership with Point2Point at Lane Transit District, will host Wheels by the Willamette from 4 to 6 p.m. on Friday, May 17 on the Northbank Path at Aspen Street and West D Street in Springfield. The event will feature free bicycle safety checks offered by Ding Ding Cycles. Additionally, free bike and pedestrian materials, such as maps, will be offered to attendees to learn more about walking and biking in Springfield. Light snacks and refreshments will be provided. The City will also host a Bike Friendly Business Movie Night from 6:30 to 8 p.m. on Monday, June 3 at Springfield City Hall. Area restaurants, hotels, bike shops, and other retailers are encouraged to attend the event to learn more about the benefits of bike tourism, how to be a bike friendly business, and for assistance submitting a free application to Travel Oregon for recognition. Food and refreshments will be provided. To learn more and to RSVP go to http://bfbmovienight.eventbrite.com. Background: Eugene and Springfield started an organized effort to support May as National Bike Month in 2014.This year events are being hosted by both the cities of Eugene and Springfield, the University of Oregon Bike Program, Eugene-Springfield Safe Routes to School, Point2Point at LTD, Willamalane, other partner organizations, and several area businesses. All activities are listed on the WeBikeLane.org website. Communities that organize their own National Bike Month activities are encouraged to post their events on the community bike calendar on the WeBikeLane.org website.